Copyright? (3 + 1 + 1 = 5) Test. On this page ... Leithead, Liddle & Sutcliffe, Lightfoot, Lumsden, McAndrew, Cowan & Potts, page bottom (donkies on Roker beach).. This shipbuilder name was first added, not because I had knowledge of the builder, but rather because I had found data about just one of the ships that he or they built. And needed a tidy place to put that data. In Jun. 2011, Alan Collie was in touch about another ship built by 'Arrow Leithead' of Pallion in 1852, a ship which carried his family to Port Fairy, in the Colony of Victoria, 290 km W. of Melbourne, Australia, in 1856/57. The ship was named William, & the vessel is now listed below. 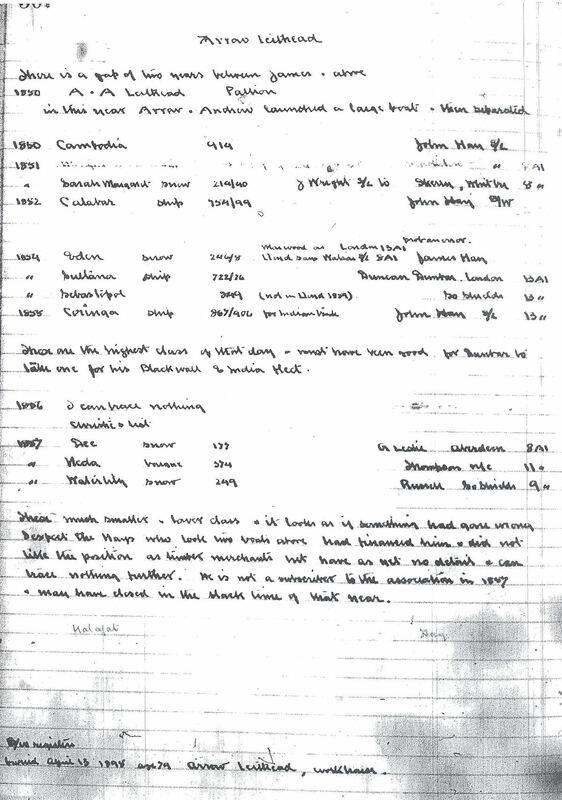 We thank Alan for providing the interesting data that he has found about the ship & about the shipbuilders of the name. An important source of data about the Leithead's is the Corder Manuscripts. 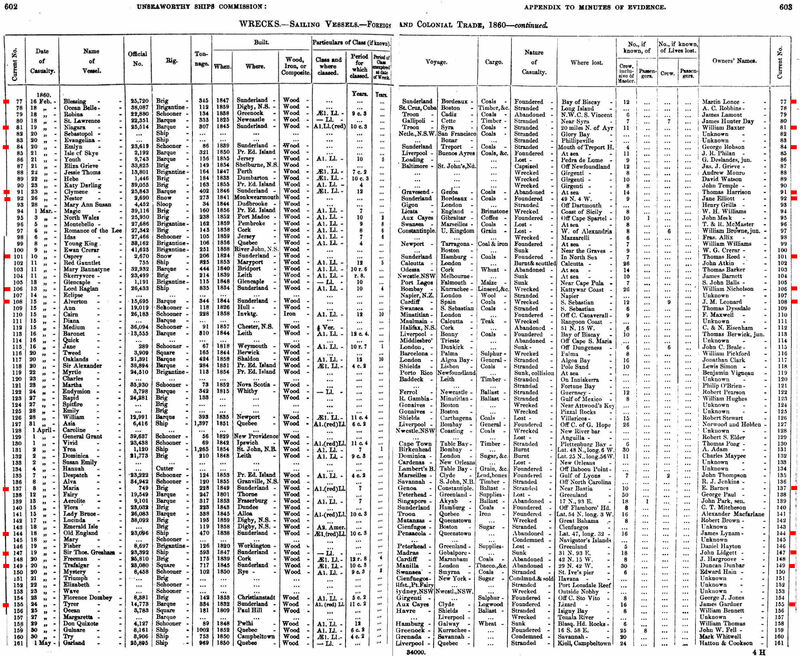 They comprise many volumes of hand written data about Sunderland, assembled over a lifetime by James W. (Watson) Corder (1867/1953). The manuscripts are held in the archives of the Sunderland Central Library, maybe at the Local Studies Centre there. Two pages of the manuscripts are devoted to James Leithead, while a single page is devoted to each of Arrow & Andrew Leithead - in each case with lists of some of the ships that they built - you can read the four 'Corder' pages in question here - 1, 2, 3 & 4. It would seem that 'James Leithead & Co.' had a shipyard at Low Street in Sunderland from 1827 to 1833, in partnership with others in the first two years. In 1834 the yard was moved to North Sands & there was no building in that moving year. But he built ships at North Sands from 1835 thru 1844, & then (1844) at Deptford & (1847) at Pallion - however Corder suspected that the Deptford & Pallion yards were one and the same. It would seem that the shipbuilder name continued with Arrow Leithead & Andrew Leithead together at Pallion in 1850. Then they parted ways. Arrow continuing at Pallion while Andrew went into business at Southwick. There would seem to be no 'Leithead' references after 1857. 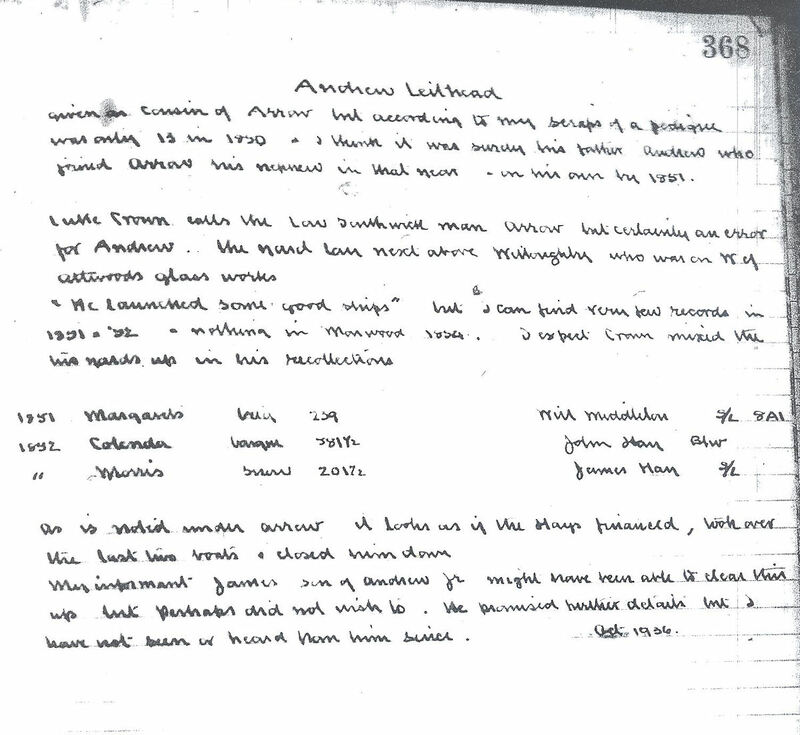 It would seem also that James & Andrew Leithead came from Eccles, Berwickshire. James, a ship carpenter, married Eliz. Wilkinson in 1809. In 1827, James went into business at Low Street with Wilton Chilton & with Marshall Bowey. That partnership arrangement would seem to have only lasted a short time. By 1829 Chilton was elsewhere on his own. Where Bowey went was not known to Corder. So from about 1829, James Leithead was on his own. Sarah Leithead, James's daughter, married Robert Adamson at the Bethel Chapel in Sunderland on Jul. 9, 1842 - per James Scott-Smith (thanks! ), in the presence of James, Martha & Thomas Leithead. Sarah was James Scott-Smith's great great grandmother. Corder believed that James died in 1848. Andrew Leithead married Christian Hume? of Berwick & named his son, born in 1837, Andrew. I have not been able to figure out the background of Arrow Leithead from Corder's words. 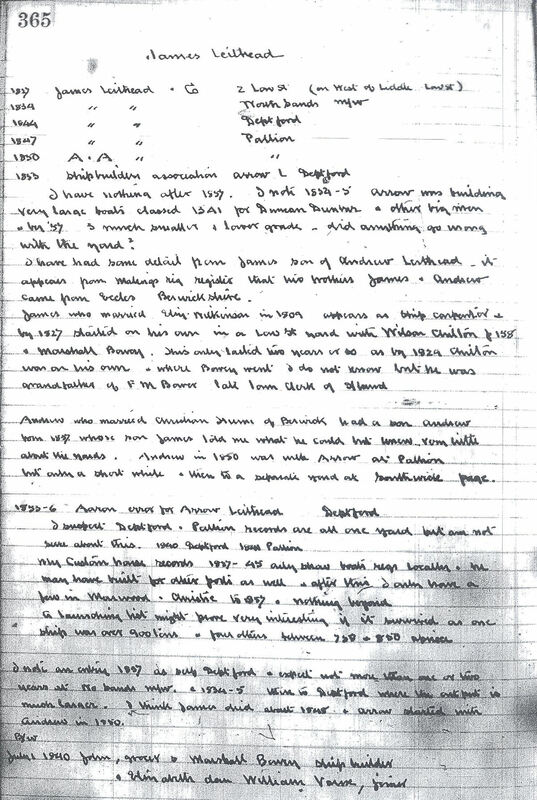 Corder indicates that he was buried on Apl. 13, 1895 at age 74 or maybe 79, referenced to 'workhouse' - so he would seem to have been born in 1816 or 1821. He likely, if you agree, is the son of James Leithead. Now in or about 1893, Luke Crown wrote about Southwick in 1847, in a document that can be read in a 'pdf' file available here. Entitled 'Reflections of Southwick'. As I understand the text, it is about Southwick, i.e. 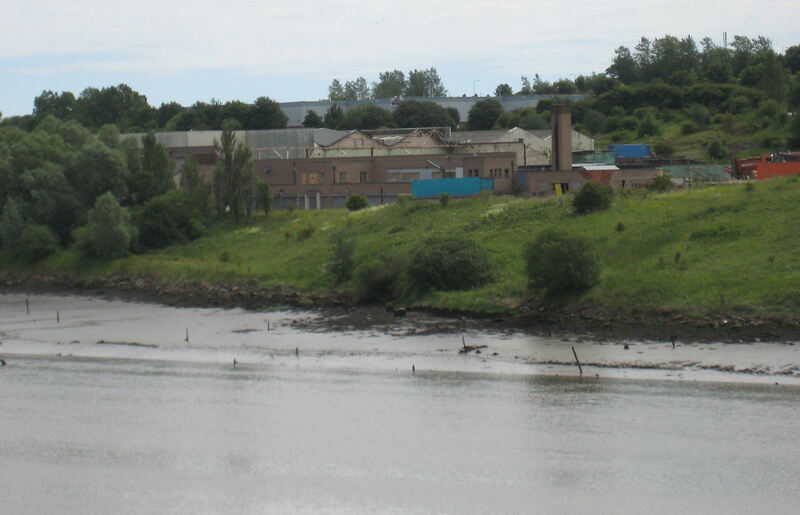 about the north bank of the River Wear rather to the west of the bridges. I think, correct me if I am wrong, that Monkwearmouth became Southwick a little to the east of Cornhill Dock, a little to the north & west of Wearmouth Colliery & today's Stadium of Light. Luke talks of Southwick & really not of Pallion which is on the south bank of the river. Anyway, Luke takes one, in his text, along the north bank of the river from east to west, & refers most briefly to the Arrow Leithead yard (of 1847?) as being, as I understand it, west of the Pickersgill yard & east of the Priestman yard. To the west, of course of the later Queen Alexandra Bridge. His words: 'A little higher up we come to a piece of ground once occupied by Mr. Arrow Leithead Shipbuilders who launched a number of beautiful ships from this berth, with a space similar to Ravens-Wheel'. Not a wealth of data I grant you, but it seemed to indicate that Arrow Leithead was at Southwick. Cordner disagreed! He believed that Luke Crown made a mistake & was referring to Andrew Leithead rather than to Arrow Leithead. Other data snippets that likely have some relevance. In 1827 James Leithead & Co., shipbuilders, were listed with an address of 2 Low Street (east end of Sunderland). In 1861, Aaron (means Andrew) Leithead was a shipbuilder at Pallion. In 1877, Arrow Samuel Leithead was born. In 1879, Mrs Arrow Leithead, was at 6 Alexandra Terrace, Hylton Road, Bishopswearmouth. No mention of her husband & Mrs Leithead was then a dressmaker. Interpreting the Corder words is not particularly easy & I may well have made mistakes. You can read his words for yourself via the 4 links above. Where roughly was the shipyard in Pallion? If you can add to my limited knowledge of the builder, do consider being in touch. Your input would be welcomed. 'Leithead' build lists are now on site - on page 146. Initially created from the 4 pages of the 'Corder Manuscripts' that relate to the Leithead's. But the list has already been modified with data from Lloyd's Registers & from other sources, & will surely be further modified in the future as new data is located. Good information about 'Leithead' is needed. Hopefully others may see these few words & be inspired to contribute what they know. A 3 masted barque, later a ship & even later a barque again. Per 1 (loss of vessel), 2 (data & images), 3, 4 & 5 (all data), 6 (Basil Lubbock re teredo navalis). The vessel would seem to have been owned by Duncan Dunbar for its entire, if brief, lifetime, though link 3 states that the vessel was sold to a Mr. Maxwell in 1855 - if so the Maxwell ownership seems not to have been recorded in Lloyd's Registers. For service to Trans. (Transvaal, South Africa maybe), to India & to Australia. Four voyages to Australia, in 1847, 1849, 1850 & 1854, each with cargo & about 300 immigrants. George Richardson her long time captain. On Apl. 20, 1860, per line 149 here, the 717 ton square (a barque) sprang a leak & was abandoned, at 29N/42W (link 1 states 20N/32W) in mid North Atlantic, while en route from Sydney, Australia, via Manila, to London with a cargo of tobacco, etc. Crew of 30. 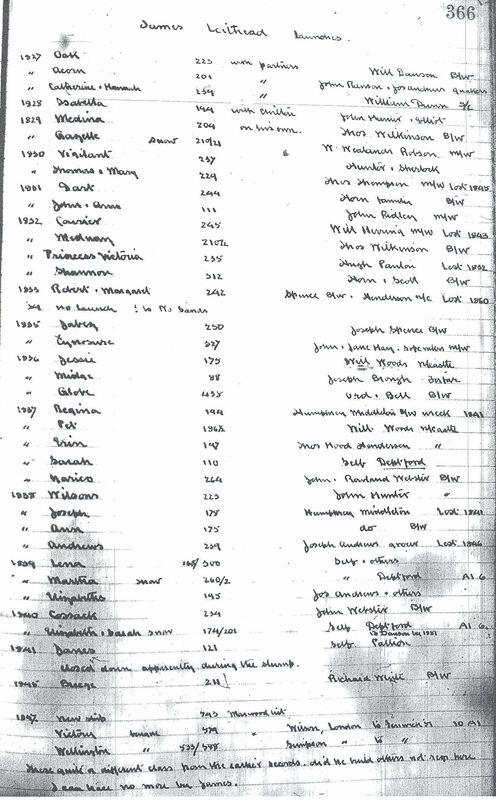 Line 149 does not indicate any loss of life, however link 4 states that 'one boat with survivors was picked up but the others were not seen again.' As essentially does 1. But link 5, a Google 'snippet', indicates that two ships effected the crew's rescue. 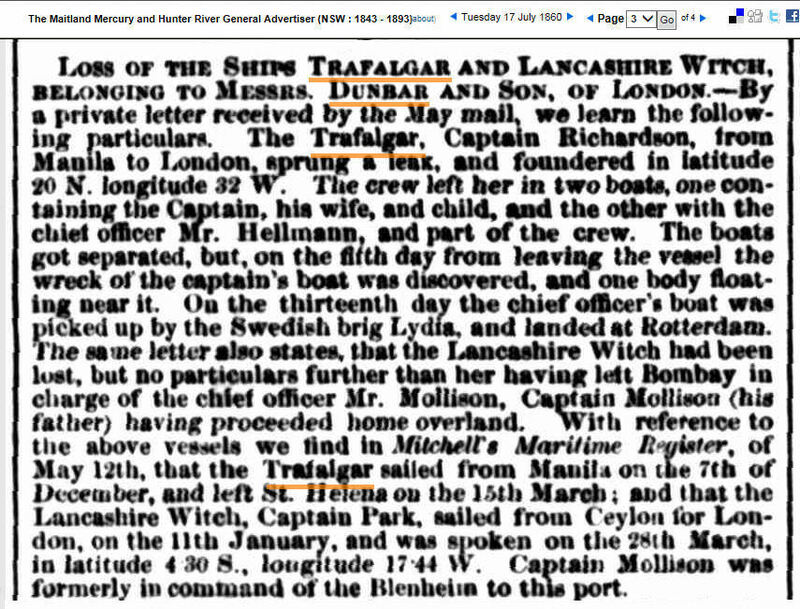 The article at link 1 states that the vessel was then owned by Duncan Dunbar but does not state the Apl. 20, 1860 exact date of abandonment as above. 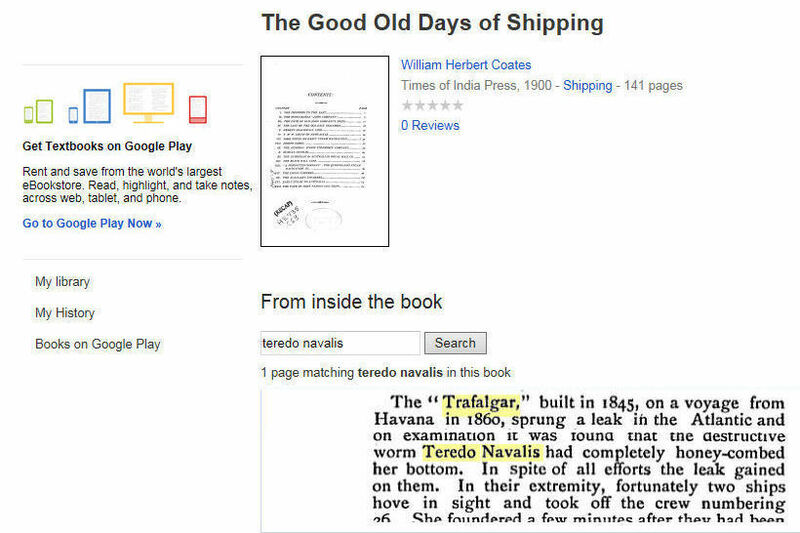 Basil Lubbock, in 'The Blackwall Frigates', published in 1922, refers to the vessel with the following comment - 'Leak through Teredo Navalis in Atlantic, 1860'. A fully rigged, 3 masted ship, that carried passengers on at least one occasion. 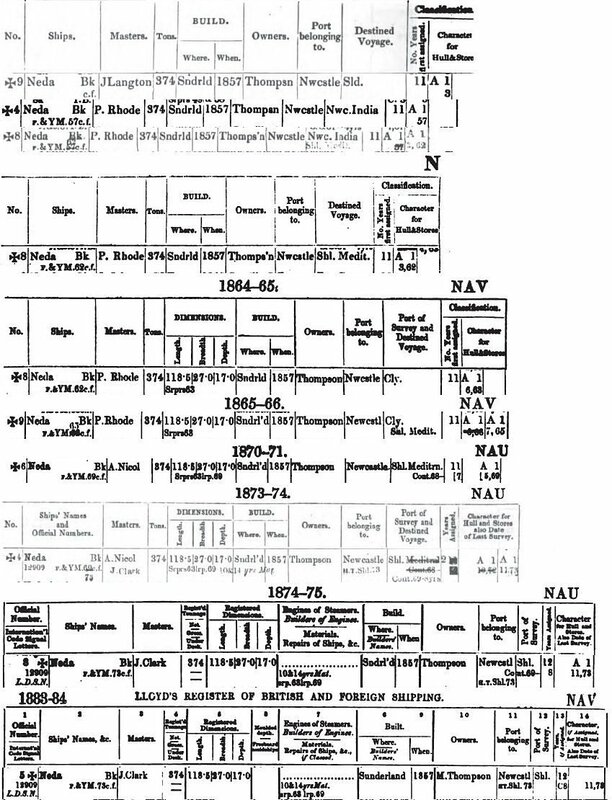 Per 1 (William, one of 4 emigrant ships to Belfast, Australia), 2 & 3 (1852 survey document), 4 (Australian data re William). 139 ft. 4 in. long, signal letters PCDG, registered at London. This listing is the result of extensive data received from Alan Collie, of Auckland, New Zealand. 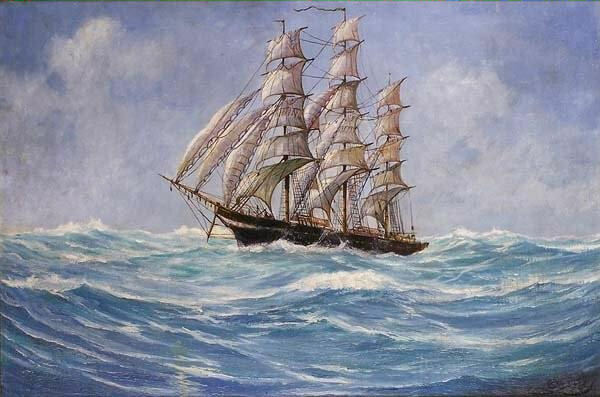 Alan advises that his family left Limerick, Ireland, for Plymouth, & there, on Nov. 4, 1856, boarded William for passage to Port Fairy, (then named Belfast), Colony of Victoria, about 290 km W. of Melbourne, Australia, with Melbourne their ultimate destination. Alan seeks additional data about William, & has asked me to include his e-mail address here, so anybody with additional information can be in contact. The webmaster has a few, but not all, Lloyd's Registers available from the time period, thanks to Google books - see left. Now those entries do not record the name of the builder. 'The National Archives', in Kew, have identified (2) Arrow Leithead, of Pallion, as William's builder. The vessel would appear to have been first owned by John Hay, of Sunderland, who may have been a ship broker or 'speculator'. He would appear to have taken ownership of the ship but within weeks sold it to 'Wade & Co.', of London. Wade & Co. was a partnership with Giles Wade, of Stepney Green, London, presumably the managing owner, owning 22 of 64 shares as did William Campbell of Woodford, Essex. It would seem, per Lloyd's, that the vessel only had one captain in its lifetime, i.e. Joseph G. (Gregg) Milton. But ... the vessel had, in fact, a number of captains. The vessel presumably voyaged to South Africa (C.G.H. means Cape of Good Hope). In 1855/56, the vessel travelled to the Caribbean, to Constantinople (Istanbul), to Odessa & Kertch, both in Ukraine, & into the Mediterranean - per Alan Collie's research. The voyages to Ukraine may well relate to the vessel being used as a military transport, after the Crimea War ended in Feb. 1856. On Nov. 4, 1856 then, William (ex London) left Plymouth for Belfast, Victoria, Australia, now Port Fairy, with 282 (3 marked in red) immigrants aboard, incl. Alan's family of 9. The vessel arrived at Belfast on Jan. 25, 1857, after a passage of 82 days, the passengers being ferried to shore in an open boat through rough surf. William was one of 4 ships (the others were Euphrates, Balnaguith & Chance) that carried immigrants from Great Britain to that Australian port. It is known that, later in 1857, the vessel voyaged to Hong Kong & to Batavia (Indonesia). 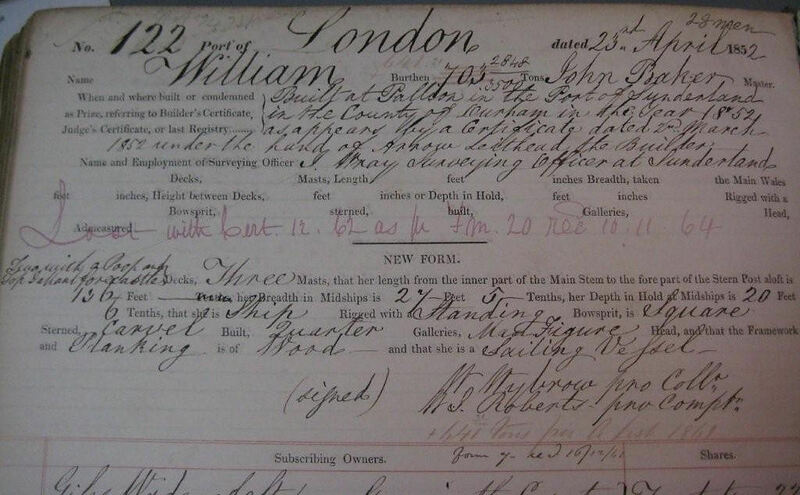 The vessel is not recorded in Lloyd's Registers after 1869/70, at least under the name of William. It is possible however that it was sold & its name was changed. It is not known, yet, what later happened to the vessel. Anything you can add? Merv Hunt has been in touch (thanks Merv!) to advise what finally happened to William, which, though it was Lloyd's registered until 1869/70 would seem to have foundered off the coast of South Africa in 1863. Merv refers me to an article in the Liverpool Echo of Jan. 28, 1863 ex findmypast.co.uk. Now I cannot access that source but have now found a similar perhaps longer article in Singapore - here. William left Singapore with a general cargo on Sep. 28, 1862, bound for London, Captain Archibald Hutton (maybe Hatton) in command, with a crew of 20. On Nov. 21, 1862, at about midnight, the vessel ran into a gale when off Cape Morgan, S. Africa (north-east of East London). Water entered the holds & pumping worked for a while until the pumps failed - the vessel soon had 8 ft. of water in its holds when the vessel had to be abandoned. The one then usable ship's boat was launched at about 6 a.m. on Nov. 22, 1863 with six crew aboard. They tried to stay close to the vessel to rescue others but that was not possible in the high seas. So they took off for the coast 10 or 12 miles distant. Only two of the six survived after scrambling ashore & wandering for days along the deserted coast. It is the account of Archibald Scotland, aged 17, one of the 2 survivors, whose report of the events is at that link. Merv advises that his great grandmother, Jane Francis aged 19, was aboard William when it arrived at Belfast, Australia, on Jan. 25, 1857. A wooden barque. Per 1 (Board of Trade inquiry into 1876 grounding & loss, ex 'Accounts and Papers', published 1876, a 'Google' book), 2 (ownership in 1858). 118 ft. 5 in. long, signal letters LDSN. 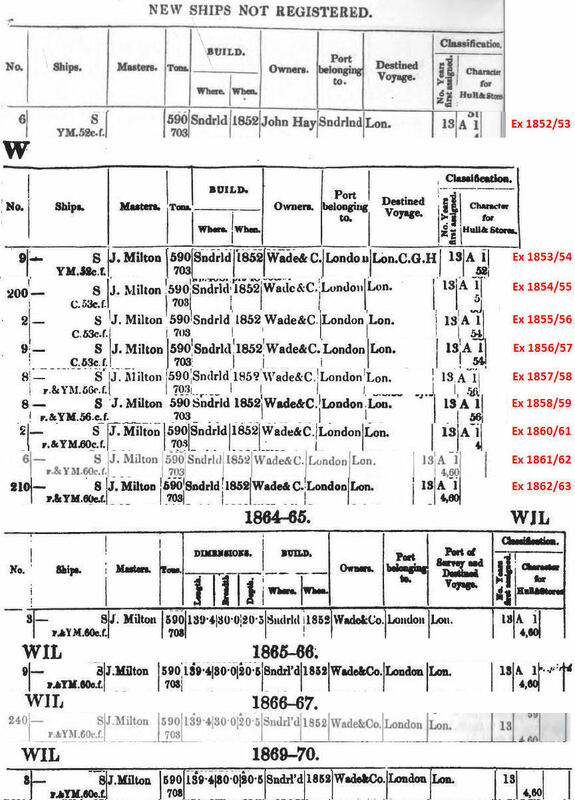 Early Lloyd's Registers do not record builders' names, & the WWW has been of no help. But data on this site page resolved the puzzle of who built Neda. The webmaster has a few, but not all, Lloyd's Registers available from the time period - and it would seem that the vessel only had one family owner - 'Thompson'. We can read, indeed, re 1858, that that meant John Thompson, of Newcastle, which data conforms to the vessel's final chapter, as next follows, except that Mark Thompson, John's son perhaps, was then the owner. On Jan. 17, 1876, Neda, then owned by Mark Thompson of Newcastle-upon-Tyne, & registered at Newcastle, Joseph Clark, ('Clark') in command, left Dublin, in ballast, for Newcastle, with a crew of 11 all told & 2 passengers also. At 1 p.m. on Jan. 23, 1876 the weather became bad - a gale from the SSW, & both rain & fog. Ushinish Lighthouse had been passed & Cape Renish had been safely reached at that time & course was set to pass thru the narrow strait west of Shiant Islands. The fog got worse & at about 3:40 p.m. land was sighted - but the vessel was drifting rapidly inshore & there was no prospect of clearing the land. Clark resolved to beach the vessel while there was daylight, in an effort to save lives. 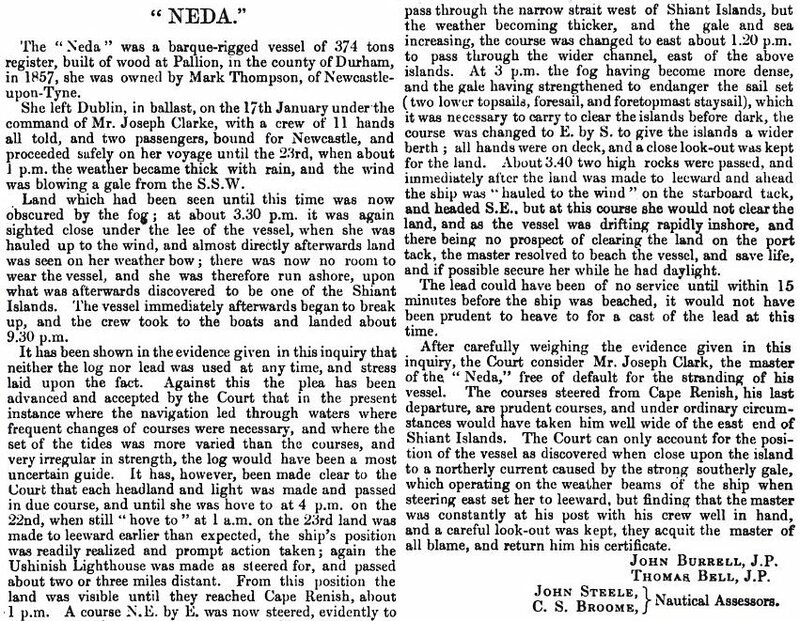 Neda went aground, on Jan. 23, 1876, on one of the Shiant Islands, (between Skye & Lewis in the Outer Hebrides) & immediately began to break up. The crew, & I presume the passengers also, took to the boats & safely made land at about 9:30 p.m. The Court noted that no soundings were taken, but that such soundings would not have been helpful regardless. The Court concluded that Clark had steered prudent courses which courses, under ordinary circumstances, would have kept the ship well wide of the E. end of the Shiant Islands. He was constantly on duty as were the look-outs. Clark was acquitted of all blame & his certificate was returned to him. Can you add anything? Little more than a name today. James Liddle & John Sutcliffe, in partnership, built wooden ships on the north bank of River Wear at Hylton. 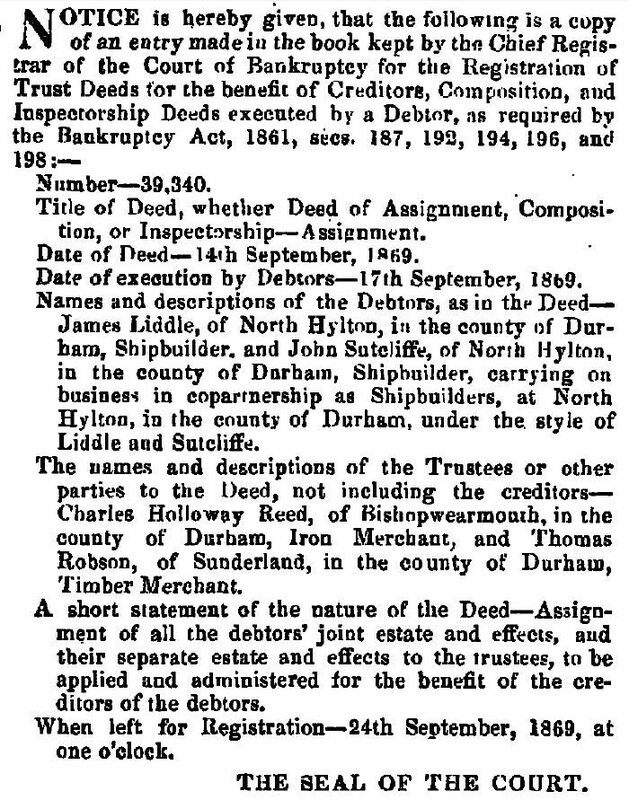 I read (1 & 2) that the firm is referred to in 'lists' in both 1863 & in 1869. And in 1869, on Sep. 28th, the firm went bankrupt as you can read here (ex the London Gazette). I add them into the site as shipbuilders having, thanks to Roger Barrett, identified a ship that they built - the Pilgrim in 1866. That vessel is now listed below, & more vessels built by them will hopefully be identified in the future. There are a number of WWW available legal references related to 'Liddle and Sutcliffe' or 'Liddle & Sutcliffe'. A ship was under construction at the time of the bankruptcy & the ship & the materials necessary to complete it were sold as part of the bankruptcy proceedings. The legal data that is WWW available about the matter relates more to the purchaser than to the shipyard & is perhaps beyond the terms of reference of this site to cover in detail. If you have data about the yard, do consider providing it to the webmaster, for inclusion here. A brig. 98.7 ft long, signal letters JCGL. The vessel is not Miramar listed. 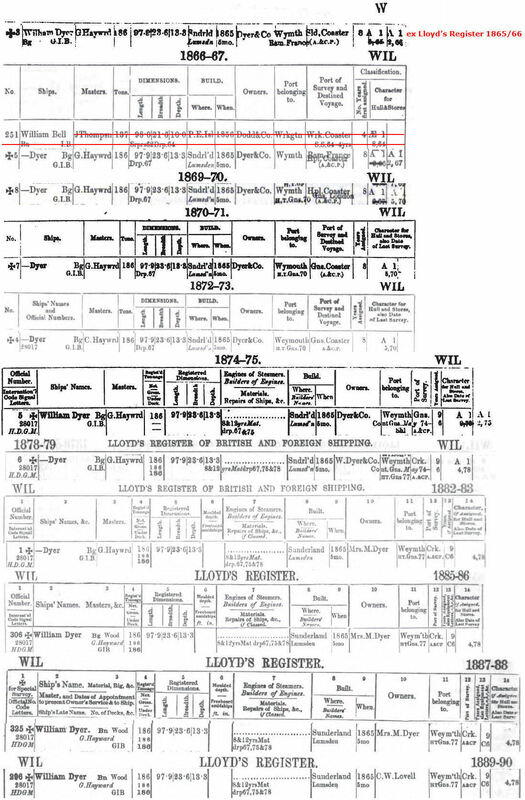 The webmaster has a number of editions of Lloyd's Register available to him from 'Google' books, see left. The vessel was built for Adams & Co., of Salcombe, Devon, U.K. For the West Indies & then West African trade, it would appear. 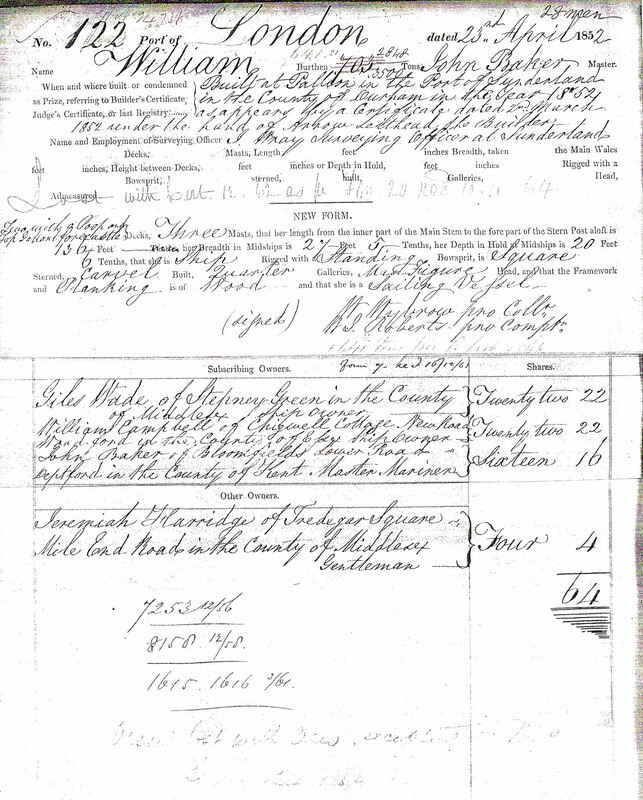 The Mercantile Navy List of 1870 records John Adams of Kingsbridge, Devon as the then owner. In the 1874/75 edition of Lloyd's, the registered owners had become 'Thomas & Oxley', also of Salcombe. 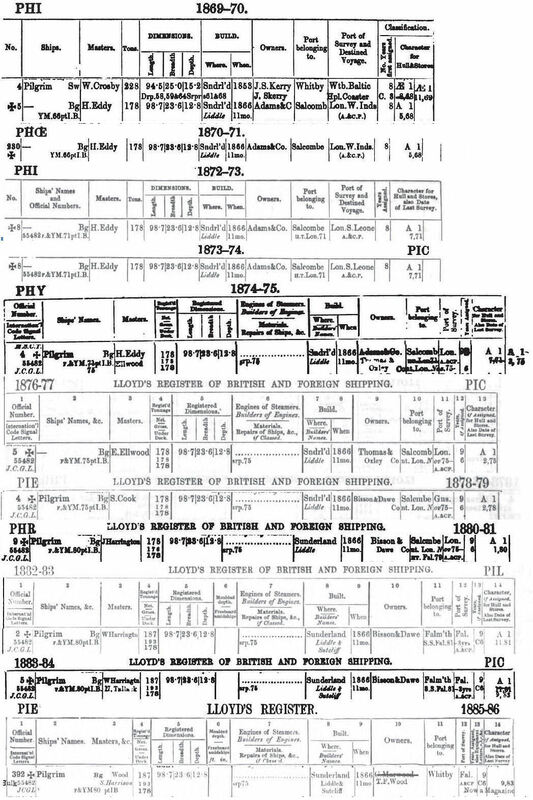 The 1878/79 register records the sale from Thomas & Oxley to 'Bisson & Dawe' a noted fleet owner of Falmouth, Devon, who remained the vessel's recorded owners thru the 1883/84 register. 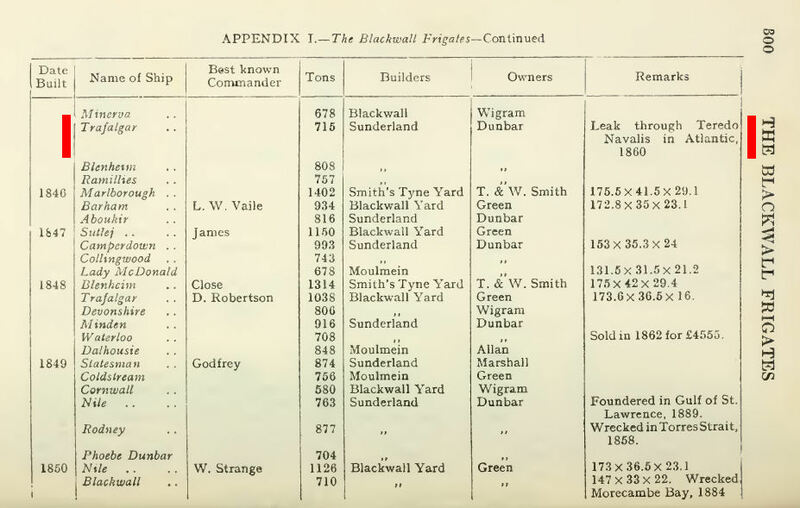 The Mercantile Navy List of 1880, however, records Philip Dawe of Penryn, Cornwall, as the vessel's then owner. The next register available to the webmaster, that re 1885/86, seems to record the sale from 'G. Marwood', of Whitby, to 'T. F. Wood', also perhaps of Whitby, but also records the vessel having become a hulk with the added words ('Now a Magazine'). There is little data, WWW available, about the vessel. Can you add to the above, or correct anything? Roger Barrett, who is researching Salcombe based ships, would welcome additional data also. Little more than a name today. He had a shipbuilding yard, in Hylton Dene, in the late 1830s, a yard about which the webmaster knows very little at this moment. The yard is notable perhaps because William Pile, the famous William Pile of Sunderland maritime history, was apprenticed there, probably in or about 1837, as you can read here. A builder of wooden ships, of course, & probably (the ships!) of modest size since the Wear is a modest river that far up! We do have the briefest of references on site to two ships that he built in 1857, Briseis of 313 tons & Swansea of 354 tons. Surely many more in the years prior to and maybe after that date. So he must have been in the shipbuilding business for 20 or so years at least. But the data on site about Thomas Lightfoot is at present truly negligible. If you have data about Thomas & his yard, do consider providing it to the webmaster, for inclusion here. Just a name today. The webmaster knows virtually nothing about the shipbuilder. If you have data about the yard, do consider providing it to the webmaster, for inclusion here. However, I read that 'E. & R. Lumsden' were building ships at Monkwearmouth Shore in 1830. And, in a 'Google' snippet, I read that 'J. & E. Lumsden' operated a shipyard from 1865 to 1869, & built 10 wooden vessels. They apparently were primarily manufacturers of anchors, which explains a brief reference I also spotted to 'Lumsden, Byers & Co.', ship owners perhaps. 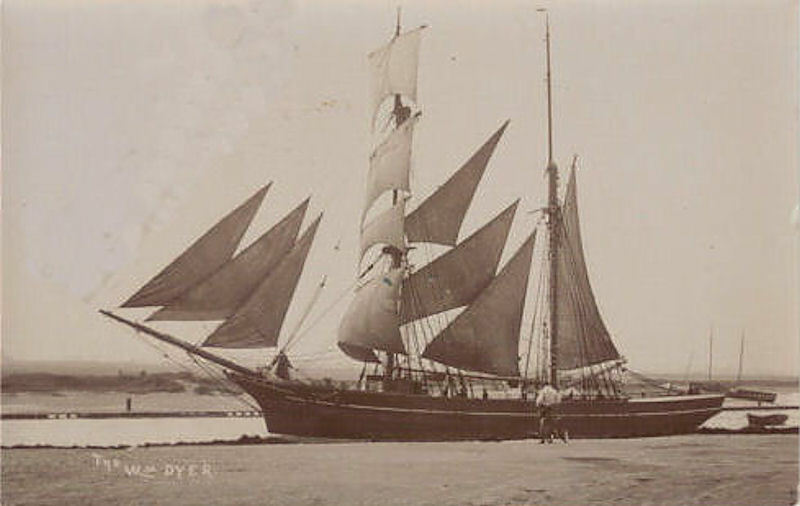 I include the builder name(s) on this page, in Feb. 2012, as a result of seeing an eBay listing for a postcard photograph of William Dyer, a 186 ton brigantine, built by 'Lumsden' in 1865 - for Dyer & Co. of Weymouth - vessel now listed below. You can find the names of all 10 vessels by searching for 'Lumsden' on this site page. I know virtually nothing about this South Hylton shipbuilder. I include the name as a result of learning that they built a couple of modest ships at least in 1894. Modest? The vessels that have come to my attention so far are Hawke, of 189 tons & Carew, of 133 tons, both built in 1894. It would seem that 'McAndrew' was, in fact, George McAndrew, & that he initially intended the yard to be named 'George McAndrew & Co.'. That from 'Marine Engineer & Naval Architect', of 1894, in which was indicated, in the Jan. 1894 issue, as follows:-. I have seen no references to exactly where their yard was located at South Hylton, but it clearly was at the site of a prior shipbuilder. For your pleasure & interest. 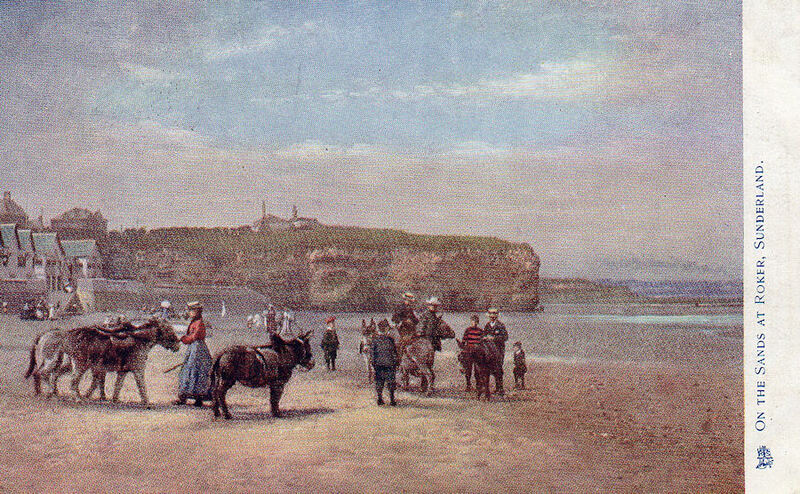 A postcard of donkeys on Roker Beach. Mailed to a Newcastle address in 1903. A pretty image, I hope you will agree - cleaned up a little for presentation here. A bigger version? here. There are more postcard images of donkeys on Roker beach here.